I have been interested in railway signals for almost as long as I can remember. As a small boy I was often taken out on the Malvern commons, adjacent to the former GWR line from Worcester to Hereford, and I would watch the trains as they went by - steam, of course, in those days - and the signals being cleared for each train and put back afterwards. My grandfather had been a stationmaster in Malvern and our whole family understood trains and signals. When I got a bit older, he explained how the signalling system works, and what actually happens inside those mysterious signal boxes - and I was hooked! In my early teens I started travelling around on the railways, and in the summer I would get a week-long rover ticket covering the whole of the Midlands. I already had a camera by then, so I started to photograph as many interesting signals as I could find. Most of the other rail fans I knew were mainly interested in locomotives, so it struck me that somebody ought to be pointing a camera at these signals, as the traditional semaphore variety were rapidly disappearing by then. Apart from being very colourful, there was a wonderful variety of unique configurations and many different styles of former railway companies. My original aim was not to provide detailed explanations of signalling here. Though its basic principles are simple, the details get complex and technical, so are not most people's cup of tea. John Hinson's superb Home Signal page contains far more comprehensive a knowledge base than I could ever muster, and brilliantly presented. Further down I have also provided links to a few other key signalling sites. If you do want to know more, these are the best places to start looking. But as this site developed, from time to time I found I needed to include basic descriptions of some items appearing in photos and/or videos for which there was no readily available external site to link to. After a number of these explanations had accumulated amongst my pages in wholly ad-hoc fashion, I eventually added a small dictionary of links to photos with captions that explain how particular items of equipment work. But apart from those I'll leave the technical details to the experts, and concentrate here on sharing some highlights from my photo collection, as well as my reasons for finding a passion for signals! 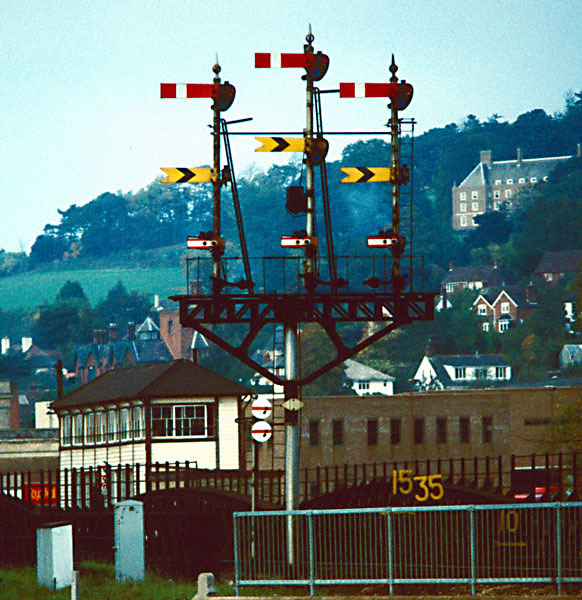 As an aperitif, therefore, the signal above used to control the northern entrance to Newton Abbot station in Devon, on the ex-GWR West of England main line. Sadly, it was replaced by colour-light signals when the Exeter area was resignalled. It has four 'dolls' because there were four possible lines a passing train could be routed onto. The higher the doll, the more important the route - the second line from the left was the through running line here. This is a lower-quadrant signal, as was standard on the GWR and the former Western Region of BR as it became - this means the arms move to point roughly 45� downwards to give a clear indication to the trains. In doing so, this also brings the green spectacle lens in front of the corresponding oil lamp to give a visible indication at nighttime. But if you look more closely you will start to see the unique variations that can sometimes be found even on one signal gantry. The home (top, red) arms on the two middle dolls are a standard Great Western design made from wood, while the one on the right is a later BR pattern in metal. Each has its own style of spectacle glass casing too, and see how the rightmost doll is missing its finial! The distant (lower, yellow) arms on the second and fourth dolls are of an unusual pattern that was only found at Newton Abbot - these are operated by motors (the black boxes) mounted immediately behind the arms themselves, a very rare arrangment, and again have a distinctive spectacle glass holder design. There is a lot of history on this gantry! The shorter home arm on the very left leads to a lower-grade goods line, and the distant arm on the 3rd doll is fixed to indicate that trains must always proceed with caution when travelling by that route. Over the years I accumulated a collection of about 2000 railway photos, almost all on 35mm transparencies, though I had more or less stopped taking signal photos in the late 1990s. I am steadily digitising these and include some of these classic shots on this site (see the Shrewsbury, Worcester, Exeter, Newton Abbot, Taunton, South Wales and West Midlands pages). But getting the EOS 20D camera made it a lot easier to display new photos here, and as a result has rekindled my interest in taking signal photos. Indeed almost the first subjects I pointed the EOS 20D at were signals at Worcester and Ledbury. Abercynon Charming Welsh valleys junction which had lower-quadrant semaphores until resignalled in 2008. Abergavenny Good North and West semaphore collection south of Hereford. Abergele Pleasant North Wales station between Rhyl and Llandudno. Aberthaw Wonderful collection of lower-quadrants on the Vale of Glamorgan line. Banbury Eclectic mixture of lower- and upper-quadrant semaphores and colour lights. Includes a video of two new lower-quadrant semaphore signals in action during the winter 2010/11 Reading blockades. Bargoed Topmost box on the Rhymney valley line. Barry Junction for Barry Island on the Vale of Glamorgan line. Birmingham New Street Unusual-style colour-light signals on the station platforms. Bognor Regis Arun Valley seaside terminus that sports various interesting signals. Brereton Sidings Nice set of semaphores at Rugeley on the Chase line. ex-Cambrian lines Vintage pre-RETB shots from the Cambrian main and coast lines. More photos now added. Craven Arms Junction for the Heart of Wales line on the North & West. Droitwich Spa Worcestershire junction with centre-pivot bracket and five stop signals in each direction. Exeter West of England centre where the GWR and LSWR main lines crossed one another. I have included individual pages for Exeter West (above, right), Exeter Middle, Exeter Central, Cowley Bridge Junction and Exeter City Basin boxes. Gloucestershire Warwickshire (Steam) Railway Signals and box visit photos from Toddington, Winchcombe, Gotherington and Cheltenham Racecourse on this friendly heritage line. Gobowen Junction of the former line to Oswestry, where the GWR met the Cambrian. Greenford The last surviving semaphore signals on Greater London passenger lines. Includes a short video clip of the signals in action when Chiltern and WS&MR trains were diverted to Paddington, and photos of the box from an official visit in July 2010. Harringay Park Jct London location where semaphore signals survived into the 21st century, though since resignalled. Helsby Scenic Cheshire junction sporting an upper-quadrant co-acting signal. High Wycombe A good collection of lower-quadrant semaphores before the Marylebone resignalling. Kew East Jct Northern corner of the triangle between the North London line and the ex-LSWR Hounslow loop. Kidderminster Covering both the NR and the Severn Valley Railway semaphores here. Ledbury Still colourful and interesting even since the Hereford line was singled. Llandudno A short branch to the town leaves the main Holyhead line at Llandudno Jct, with signals at every station. Lincoln Vintage photos from an organised signal box visit in 1983, before St Marks station was closed, and further shots from shortly prior to the 2008 resignalling. Includes separate pages for Boultham Junction, High Street, Pelham St Junction, St Marks Station, East Holmes and West Holmes. London A collection of mainly historical photos from around Greater London. I have organised this selection into separate pages for the former Great Western and Great Central joint line, Marylebone - Neasden (South) Jct, Acton - Cricklewood, Upper Holloway - Junction Road Jct, various North London Line locations, Camden Jct - Watford on the 'DC lines', and Kings Cross - Finsbury Park. Malvern Wells Where I regularly watched the signalling and trains as a kid. More photos now added. Moreton-in-Marsh Attractive, well-signalled Cotswold line station, now working AB in both directions following redoubling. New Cumnock Good collection of signals on the former Glasgow & South Western line. Newton Abbot West of England main line junction for the Torbay branch. I have included individual pages for West, East and Aller Junction boxes. Park Junction Double junction at the foot of the Ebbw Vale line in Newport. Pontrilas Block post south of Hereford and the former junction for the Golden Valley branch. Radyr Historical photos of Radyr Junction and Radyr Quarry Junction. Rhyl Another major station on the North Wales coast. Shrewsbury The Mecca of mechanical signalling on Network Rail. As I've, naturally, taken a lot of photos here, including number of vintage shots scanned in from slides, I have now created separate galleries for each of its six signal boxes: Severn Bridge Junction, Abbey Foregate, Crewe Junction, Sutton Bridge Junction, Crewe Bank and Harlescott Crossing. I've also added a diagram, on the main page, to help you understand things if you're not already familiar with the layout there. St Albans South Former Midland box preserved in situ by the St Albans Signal Box Preservation Trust. Swansea Docks Photos of Burrows Siding and Kings Dock Junction. Taunton Key Great Western main line station shortly after the convergence of the Bristol and Berks & Hants routes. I have included individual pages for West Station, East Junction and Silk Mill Crossing boxes. Tondu Charming Welsh junction still having a fine collection of semaphores. Walnut Tree Junction Fascinating ex-Taff Vale signalbox at Taffs Well on the Cardiff-Pontypridd line. Warrington Timperley & Garston line: four signalboxes in a mile until this section was resignalled in 2012. Woofferton Jct Former junction on the North & West line. Worcester Another wonderful place for lower-quadrant semaphores, with separate pages for Shrub Hill station, Henwick and Foregate Street station area, Tunnel Junction, and Norton Junction. Again, I've added a diagram, on the main page, to help you understand things if you're not already familiar with the layout. I've also put together a Google Earth signal locations dataset and a short video clip of signals being worked at Shrub Hill. Wrexham Today's view plus shots from 1982 when the Brymbo branch was still open. Yeovil The lower-quadrant semaphores at Pen Mill station. Ystrad Mynach Superb collection of signals on the Rhymney valley line. Various West Midlands locations Interesting shots from various West Midlands locations including Sutton Coldfield and Stratford-upon-Avon. When photographing railway locations I try to record as much of the track layout and signals as possible without trespassing. As mentioned above, I've included technical explanations of equipment alongside various photos for which I couldn't find relevant information on external sites to link to. Eventually I compiled the following index so anyone interested in a particular items or topic can easily locate the pages with the relevant photos/videos and descriptions. I try to keep my explanations as simple as possible, so for further information I'd suggest you look on expert sites such as the Home Signal Page or in specialist railway signalling books. Where items are new to you I recommend following the links about them in the order listed below as in some cases I have arranged these to present the information in the most logical order. Axle counters Crewe Jct; Abercynon. Block instruments Boultham Junction; Lincoln High St.
Calling-on signals Boultham Junction; Machynlleth; Severn Bridge Jct; Worcester SH; Crewe Jct; Coventry; Nuneaton; Bognor Regis. [TS1 4.6.1, fka Rule 39(a)] Droitwich Spa (1), (2); Worcester SH; Greenford. 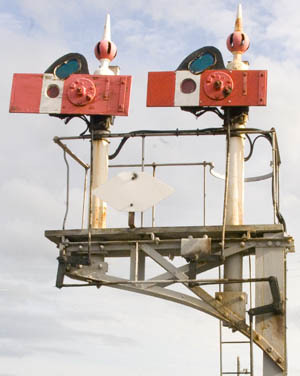 Co-acting signals New Cumnock; Helsby; Coventry. Facing Point Locks (FPLs) Crewe Jct; Lincoln St Marks (Economical); Severn Bridge Jct (1), (2). Ground Frames Banbury S; Bognor Regis; Worcester SH (1), (2). Lamp indicators Greenford (1), (2). Levers in signalboxes Boultham Junction; Greenford. Lever leads Boultham Junction; Pelham St Jct; Toddington; Greenford (1), (2). Permissive (vs Absolute) Block Boultham Junction (1), (2); Lincoln High St; Pelham St Jct. Point detectors Severn Bridge Jct; Worcester SH; Park Jct. Route indicators (illuminated) Pelham St Jct; East Holmes (1), (2); Birmingham NS; Nuneaton; Coventry. Route indicators (mechanical) Yeovil PM; Worcester SH (1), (2); Stourbridge Jct. Signalbox diagrams Boultham Junction; Lincoln High Street; Pelham St Jct; Greenford. Signal repeaters Pelham St Jct; Toddington; Greenford. Slotting Crewe Bank (1), (2); Harlech (backslotting); Boultham Junction; Dudding Hill Jct; Crosfields (4-way example). Tail-Lamp Cameras Droitwich Spa (1), (2); Sutton Bridge Jct. Track circuits Lincoln High Street; Greenford. Welwyn Control Pelham St Jct. 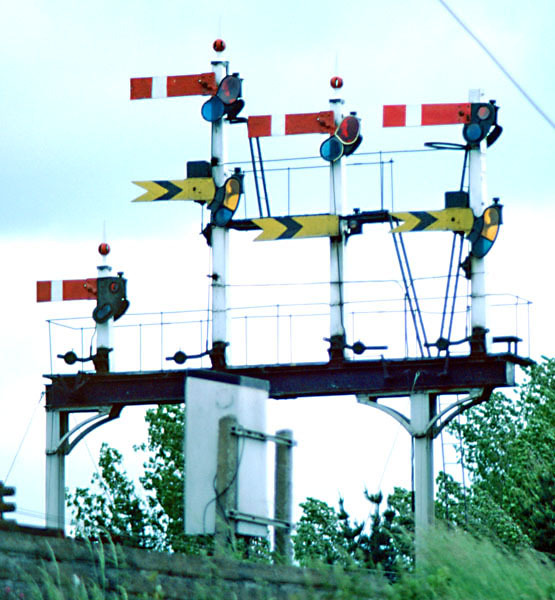 As mentioned above, The Home Signal Page is a comprehensive site and by far the best starting point for anyone wishing to gain a better understanding of signalling principles and its history among the British railway companies. The associated Blower email list has now been transformed into the Signal Box Forum, a lively web forum for signalling fans, and there is also a comprehensive directory of links to other signalling sites. I don't attempt, therefore, to list everything else here, but the following is a brief digest of some other key signalling and related railway sites. 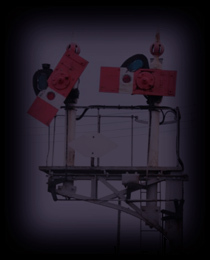 Signalling Notices, run by Danny Scroggins and Luke Cartey, is a good repository of signalling details and notices. The Severn Valley Railway S&T Department has a lot of interesting material, including a map with locations of all GWR signalboxes. The St Albans Signal Box Preservation Trust have preserved St Albans South signalbox in situ, and it is now regularly open to visitors. Railsigns tells you all about those lineside signs used on the railway. Railways of North Wales is a great gallery run by Dave Plimmer. Though not specifically signalling-related, signals do appear in a lot of his photos. Finally, I heartily recommend both Blockpost Software's mechanical box simulations and SimSig for anyone with a PC who wants to get a feel for what operating a signalbox was or is really like. You signal the trains; the simulators keeps up their positions and speeds based on the signal aspects, line speeds and timetable. Though I'm normally someone who gives computer games a wide berth, these really have got me hooked! If you're new to this, I'd probably suggest starting with SimSig, as many of their simulations are free and you'll need a reasonably good understanding of traditional signalling procedures and bell codes to work the mechanical box simulations. SimSig offers real-time emulations of a number of modern Signalling Control Centres, ranging from the areas controlled by major power boxes such as Swindon, Westbury and Exeter, to fictional signalling centres such as for the North London Lines. Its screen display is in the same format as actual IECC workstations, actual NR track layouts are used, and actual working timetables are provided (there is generally more than one timetable available for each location). You even get phone calls from drivers held at red signals and can give back special instructions. SimSig also simulates random train delays and can emulate signal, point or track circuit failures. The public version is free to download, though its bigger brother is now used in Network Rail training centres. The Blockpost Software mechanical box simulations, which include Exeter West, incorporate great graphical displays of the box diagrams, block shelves and signal levers. You click on the block bells to ring messages through to the adjacent boxes, and on the levers to pull or restore them. As well as running the trains, the simulators work the block instruments according to the codes you ring on the bells, and make the other boxes ring you as if in real life. The levers are fully interlocked and won't move if the interlocking state prevents this. Steam Engines toot their whistles to let you know when they're ready for the next move. Great fun running a railway in your own home!